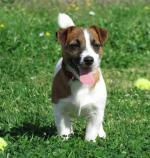 Basic dog obedience training should be started right away when a new puppy or adult dog joins your family. Don't wait a couple weeks for the dog to "settle in". As a certified dog trainer, I recommend and use balanced training for all breeds, personalities, and sizes of dogs and puppies. If you haven't already done so, take a minute to read about my recommended dog training method. Being informed is the first step to making a change! Basic dog obedience training is most often where you'll need to start with a new puppy, or an adult dog that has little or no obedience training. You should always take your puppy to obedience classes, as opposed to attempting training on your own at home. These classes are offered at most dog schools. It can range from 4 to 10 weeks in length, with usually one 30 to 60 minute lesson each week. Initially your training will consist of house training (at least for a puppy) and hopefully crate training (for both puppies and adult dogs). My dog, Justice, was house trained easily within a week, and crate trained within a couple weeks as well! A crate is going to be your new best friend when it comes to house training - they go hand in hand. And used properly, your dog will love his crate! I can always find Justice curled up in her crate throughout the day, and she sleeps there at night, too. It's her safe place, where she is comfortable and calm. Crate training a dog is easy, if you do it the right way. Take your time on each step, and never use it for punishment or "time-outs"! It makes house training a puppy a breeze, so make sure that you start as soon as your puppy or new dog comes home. To get you started with basic dog obedience training, I want to give you some easy tips to start putting into practice with your puppy or adult dog. 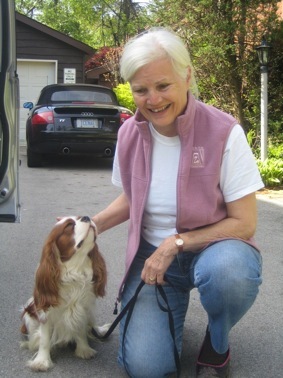 Yes, an older dog can learn basic obedience training, too! always be consistent - use the same commands all the time to avoid confusing your dog, and make sure the whole family is on the same page. Don't change the rules... either he's allowed to pull you on your walks, or he needs to heel by your side each time - you'll confuse him by switching up the rules depending on what mood you're in! don't give time-outs - a dog can't understand a time-out. Dogs live for the moment, so reward and correction must be for the moment, too. The only thing putting your dog in his crate for a time-out will do, is make him hate the crate. If you want to correct him for chewing your shoes, you have to catch him in the act, not 10 minutes or an hour later. be patient - especially with a puppy, they will try your patience at times. Regardless of the age of your dog, you always have to be patient. A dog is never "fully-trained", and will be in training for life. So realize this, take a deep breath when he doesn't perform up to your standards (which are probably too high! ), and keep practicing. set your dog or puppy up for success - if you take your green dog or puppy on the busy sidewalk where dogs and people are walking by, kids are on rollerblades and bikes, bouncing balls... then expect him to do a sit-stay off leash the first time you practice it - yes, he's going to fail. Understand this - the more often a dog fails at something, the more he's going to want to avoid that exercise because you're never happy with him. Instead, keep distractions to a minimum when first training, and work in tiny increments. And don't drop the leash until you are 150% sure that your dog will stay. This ensures that the training exercise will be successful, and your dog will be happy to repeat that good behavior again next time! Basic dog training is good for dog and owner! Be wary of a trainer who tells you to remove the leash from your puppy's collar during these first weeks of training. As much as you or the trainer might believe in him, a pup or untrained adult dog is not ready for off-leash training yet! That level of training comes with time, and lots of practice and distraction-proofing. I am also not in favor of segregating puppies from adult dogs in basic dog obedience training. "Puppy classes" aren't the best option, especially as the pups are often allowed to play with each other during class. Why is this a problem? I think you need to be picky about choosing your puppy's friends, otherwise he will pick up bad habits. When a room full of puppies are allowed free reign with each other, it involves a lot of nipping, barking, jumping and other undesirable behaviors. Well, what about the socialization aspect? A dog or puppy does not need to be jumping on and sniffing at each other to be socialized. Simply being around other dogs, seeing them, hearing them, being able to smell as they move around is socialization. I also find that puppies can learn a lot from being around older and calmer dogs. The same thing goes for special small dog classes. You are not going to solve a small dog's fear of bigger dogs if you won't allow them in the same room! By training all breeds, sizes, and ages together, all of the dogs will benefit from the socialization. Most dogs are ready to move on from basic dog obedience training after about 10 weeks, so long as you have been practicing every day for at least 15 minutes to a half hour. 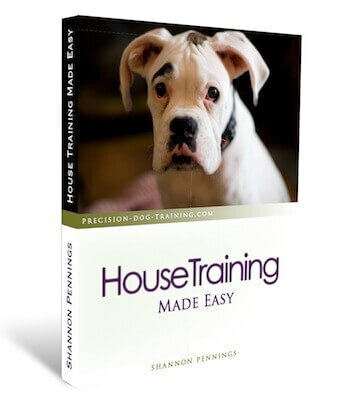 Ready for the next level of dog training? See what the intermediate level is all about. We're a growing community on Facebook, too! Click the Like button below to follow along, then pop on over to say hi. I'm always adding to this site, so if it's your kind of place, why not bookmark us and visit us again? We'd love to see you! Links to new and updated pages are always included on our Blog Page.